Nearly 45 years ago, Clint Eastwood and director Don Siegel changed action cinema forever with Dirty Harry, a brutal crime drama about a take-no-prisoners cop who also gets the dirtiest jobs in his city, and the killer he’s trying to bring down. The film was a massive box office hit, divided critics with its apparent political messages, and made Eastwood into the biggest movie star in the world. Now, if you’re feeling lucky, here are 11 facts about the iconic film ... punk. 1. IT ORIGINALLY HAD A DIFFERENT TITLE. Though it’s hard to imagine the film not being identified so strongly by its title character now, back when Dirty Harry was just a developing screenplay by the husband and wife team of Harry Julian Fink and R.M. Fink, it was known as Dead Right. 2. FRANK SINATRA WAS SET TO STAR. The idea that anyone but Clint Eastwood could play Harry Callahan seems strange, but a number of other stars were considered for the title role first, among them Steve McQueen, Robert Mitchum, and Frank Sinatra. Sinatra was actually attached to the film at one point, but pulled out because of an injury to his hand. So Eastwood stepped in, and the rest is history. 3. IT WAS ORIGINALLY SET IN NEW YORK. The original script called for Callahan to be a tough New York City cop, but by the time Eastwood came onboard, and re-teamed with director Don Siegel (they’d already made three films together, including The Beguiled), it was decided that the setting should be San Francisco, a city both men loved. 4. AUDIE MURPHY WAS ALMOST THE VILLAIN. Siegel made the interesting choice of approaching World War II hero-turned-actor Audie Murphy for the role of the sadistic killer known as “Scorpio.” It’s still not clear if Murphy ever considered taking the role, because he died in a plane crash before filming began. 5. TERRENCE MALICK WORKED ON THE SCRIPT. Though Eastwood and Siegel ultimately stuck close to the original script by the Finks, Dirty Harry went through several rewrites before making it to the screen. Among the screenwriters to take uncredited shots at the script was a young Terrence Malick, who had not yet had his breakthrough feature film debut with Badlands. 6. CLINT EASTWOOD’S DIRECTORIAL DEBUT MAKES A CAMEO. While filming Dirty Harry, Eastwood was on the verge of releasing his first film as a director, Play Misty for Me, and the film actually makes a small appearance in the adventures of Harry Callahan. During the iconic bank robbery scene, as Harry crosses the street—under the shower of an exploded fire hydrant—to confront the final robber (and say his famous “Well, do ya, punk?” line), a theater marquee advertising Play Misty for Me is visible in the background. 7. EASTWOOD DID HIS OWN STUNTS. For the scene in which Harry chases down Scorpio, who has kidnapped a busload of children, the character is required to leap from a trestle bridge onto the top of the moving bus. If you watch the scene carefully, you’ll notice that it’s not a stuntman making the leap. Eastwood did it himself. 8. EASTWOOD DIRECTED ONE SCENE HIMSELF. During one night of shooting, Siegel had to miss work because of the flu, leaving the production without a director. So Eastwood took over. The scene in which Harry confronts a suicidal man on the roof of a building was directed by Eastwood. 9. THE FAMOUS FINAL SCENE ALMOST DIDN’T HAPPEN. After dispatching Scorpio in the film’s final moments, Harry takes out his badge and tosses it into the nearby water. Eastwood was initially very uncomfortable with this, fearing that it would signify to the audience that Harry was definitely quitting police work for good. Siegel argued that it instead meant that Callahan was simply frustrated with the policing system that made it so hard for him to get rid of the killer in the first place, but decided to compromise. The director told Eastwood that he could simply draw back his arm as if he were about to throw the badge before thinking twice and putting it back in his pocket. 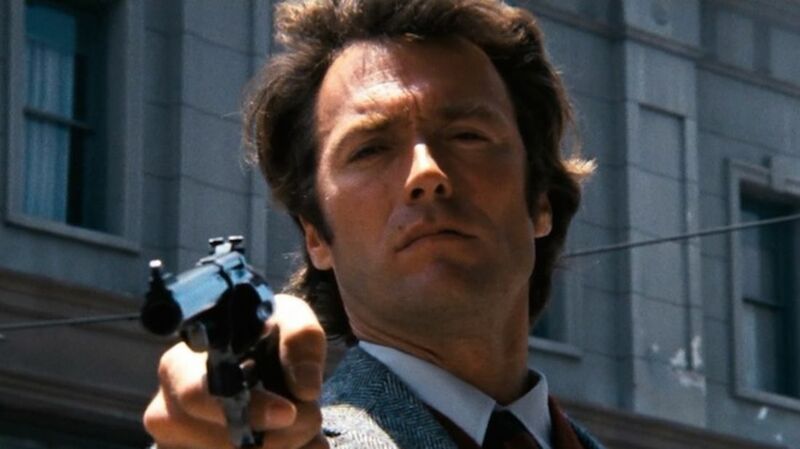 Eventually, though, Eastwood came around to Siegel’s point of view, and threw the badge. 10. CRITICS WERE NOT BIG FANS AT FIRST. 11. IT INSPIRED A REAL COPYCAT CRIME. In the film, Scorpio abducts a young girl and buries her alive, then demands ransom money from police. Apparently, this plot actually inspired a real crime. In 2009, a German couple was put on trial for the 1981 abduction and burial of a young girl after an informant turned them in. Reports from the court case revealed that they demanded ransom for her safety, and got the idea from Dirty Harry.